This whole project began when we tried to prove if a patient should be shielded in the front or the back for a PA chest x-ray. I decided to test this out using an 8×10 CR cassette that I would run at 1200 speed, making it extremely sensitive to any radiation (in an upcoming Significant Experiments I will show you exactly what we discovered when we put this front or back shielding question to the test). One thing that was extremely obvious right off the bat was how much radiation hit the cassette when it was placed on the back side (facing the tube). I had hung the cassette lengthwise with paper clips taped on and used 117 kV @ 4 mAs. As you can see below, every clip showed up on the image. What was so amazing to us was that none of the cassette was in the primary beam. So where was all this radiation coming from? We thought it might be radiation that had scattered from the molecules in the air, but that seemed unbelievable. After speaking with my colleague Quinn Carroll (who recently wrote the physics book “Radiography in the Digital Age”) he told that that kind of scatter would be physically impossible. We then thought it might be leakage radiation coming through the collimators. After showing my research to an amazing group of physicists I am in contact with, they determined that it is off-focus radiation. I now changed the experiment to have as few variables in it as possible. I wanted to use my dosimeter so that I could have exact readings as to how much dose was being emitted through the collimators. I used a large conference room and our portable machine so that I could hang my ion chamber with nothing remotely near it to cause back or side scatter. I then made close to 400 exposures (I did 5 of each and then took the average). I started with a 72″ SID, collimated the beam to 14×17 with the bottom of the light field just above the ion chamber. I used 2 techniques: 85 kV @ 3.2 mAs and 115 kV @ 4 mAs. Then I moved the tube 1″ higher and made those 10 exposures again and continued an inch at a time. With the 85 kV technique I needed to go 14″ higher before the readouts were not accurate anymore. With the 115 kV technique I was still getting precise readouts at 28″ above the ion chamber but the tube could not go any higher. I also did the experiment with a 40″ SID using 85 kV @ 16 mAs to show how this would all pan out for an average abdomen technique. 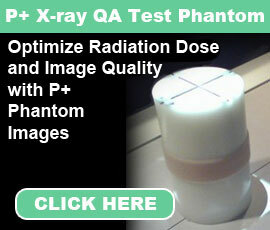 Please remember from the first Significant Experiments (http://digitalradiographysolutions.com/research-cxr-scatter.html)that the average person gets 85 MicroR’s (1/1000ths of a milliroentgen) of natural radiation each day. As you can see from the chart, almost all of the abdomen technique doses are above 85. Because numbers on charts often aren’t as remarkable as actual images, here are 3 images of a hand phantom taken with the 3 different techniques and 2 SID’s. Each of them were taken with the bottom of the light field 6″ above the top of the cassette. What has been proven so far is there is definite radiation below the collimated light field, more so on bigger techniques. Although the dose is in the MicroR’s (1/1000ths of a milliroentgen) one needs to be aware that there is a noticeable dose hitting the body outside of the primary beam. My hospital has a 100% shielding policy, but if yours doesn’t then you should definitely be aware of how much extra radiation is getting to your patient.